Newcastle decide to make a substitution, with Chris Harris getting some game time. Newcastle decide to make a substitution, with Micky Young being replaced. Jonathan Ross has made 20 good tackles so far this game. Sale make a substitution with Alexandru Tarus coming on. Sale make a substitution with Marland Yarde coming off. Newcastle sub Micky Young comes onto the field. Chris Harris departs for Newcastle. Rohan Janse van Rensburg comes off. Alan MacGinty curls the ball too far, missing the posts to the right. That's a great try assist by James O'Connor. This is dangerous for the defence as Rohan Janse van Rensburg bursts through to advance the Sale attack. A series of passes by Sale results in a try for Rohan Janse van Rensburg. Sale decide to make a substitution, with Curtis Langdon getting some game time. Sale decide to make a substitution, with Tom Curry being replaced. Rohan Janse van Rensburg has made 10 good tackles so far this game. Alan MacGinty has hooked the conversion to the right of the posts. A gap opened in the defence and Bryn Evans took full advantage. Marland Yarde sets up the try. Great hands by Sale leads to a try for Bryn Evans. Johnny Williams has made 10 good tackles so far this game. Newcastle make a substitution with Gary Graham coming on. Newcastle make a substitution with Logovi'i Mulipola coming off. Chris Harris has made 10 good tackles so far this game. Newcastle sub Kyle Cooper comes onto the field. George McGuigan departs for Newcastle. Sami Mavinga comes on for Newcastle. Adam Brocklebank leaves the field. Micky Young (Newcastle) is shown a yellow card. Alan MacGinty has made 10 good tackles so far this game. Sale decide to make a substitution, with Andrei Ostrikov getting some game time. Sale decide to make a substitution, with James Phillips being replaced. Tevita Cavubati has made 10 good tackles so far this game. Sale make a substitution with Josh Beaumont coming on. Sale make a substitution with Josh Strauss coming off. Sale sub James O'Connor comes onto the field. Luke James departs for Sale. Alan MacGinty converts the try. James Phillips scores the try from close range. Logovi'i Mulipola (Newcastle) is shown a yellow card. James Phillips has made 10 good tackles so far this game. The defensive line has been broken as Johnny Williams goes through the gap. Luke James has made 10 good tackles so far this game. Newcastle are only a few metres out, surely they must score! And they do with Will Welch touching down. Bryn Evans has made 10 good tackles so far this game. Alan MacGinty has kicked a penalty goal. George McGuigan has made 10 good tackles so far this game. Joel Hodgson comes on for Newcastle. Toby Flood leaves the field. Tickets for #YourSharks first Home game of the European fixtures are now available! @YardeM Wishing you a speedy recovery @YardeM! Retweet to vote for Rohan Janse Van Rensburg as your Fans' #SharkOfTheMatch for Sale Sharks v Newcastle Falcons! 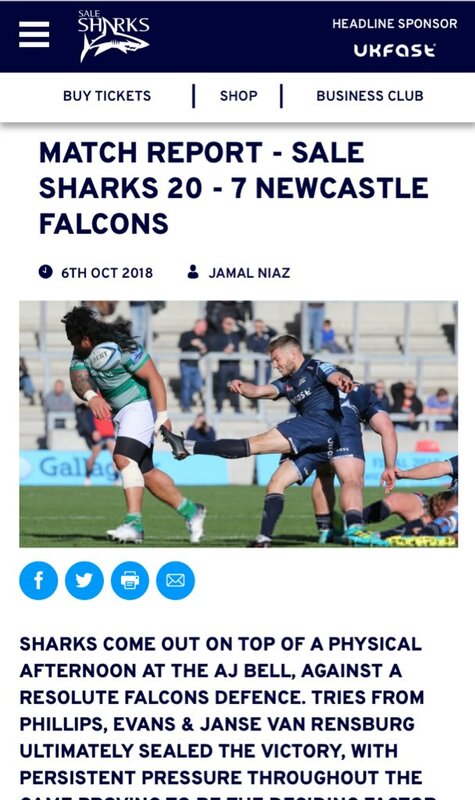 It's time for the Fans' #SharkOfTheMatch from Sale Sharks v Newcastle Falcons! Retweet to vote for Tom Curry. Plenty of time rightly being taken to tend to the injured Yarde. Wishing him a speedy recovery.